Ethereum users are welcome to experience the newest generation decentralized network and participate in community governance. Any account on the public blockchain that transfers or receives ETH from Jan-01–2018 00:00:02 AM +UTC — April 20, 2018 00:00:04 +UTC (block 4832686 to block 5471198). Account has an ETH balance of over 1 on April 20, 2018 at 00:00:04 +UTC (block 5471198). Please note! 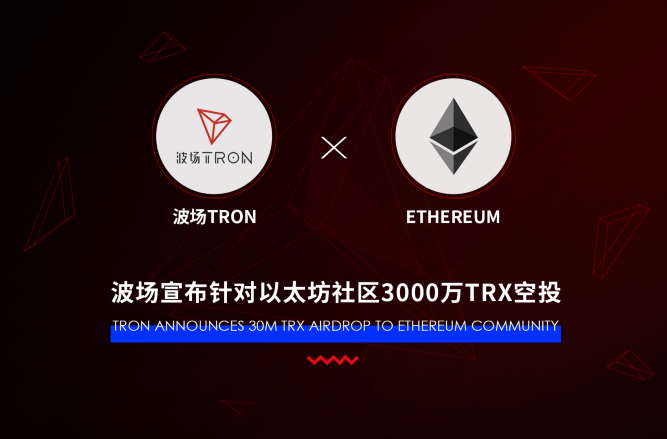 The TRON team will handle all processes for the airdrop event. We do not require any action from Ethereum users. TRON will not solicit users for tokens or addresses for ANY reason. If you encounter this type of suspicious activity, please contact customer service immediately at [email protected] https://twitter.com/Tronfoundation to avoid any financial losses. Thats awesome, I just want my 600 TRX coins that were lost trying to send them to my ether wallet. They are of no help and I can't wait until Justin Sun takes supasses Ether! I have moved my TRX because of the migration from HitBTC to Binance and this has cost me almost 3000 TRX. I am a little bit disapointed how much this migration is going to cost me. The Airdrop for the Ethereum users is nice, but i think a Airdrop for holders like me would be nice also. I think this wil cost me like 6000 TRX. Hi, i want to ask a question ,if i don't transfer the ERC20 TRX tokens from Binance to Mainnet TRX ,i know that the Binance will automatically make the transfer , But what is going to happen if i don't have account in mainnet TRX ? Is Mainnet means https://tron.network/?lng=en and i need to make account on that address ? And what is going to happen if some TRX holders don't have accounts and how all that stuff will going on ? I will be very happy if you give me some answers about that ! Thank you in Advance ! REGARDS !